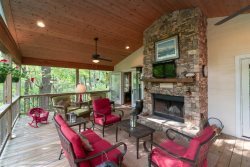 Highlands and Cashiers NC Vacation Home with Big Views and Expansive decks.Perfect for families and friends, this fully equipped Vacation rental home with spectacular mountain views. Beautiful, upscale and just a three mile drive to the Cashiers Crossroads where several public golf courses are available and just a 15 minute drive to Main Street in downtown Highlands NC. This totally renovated ASID Designer home features cathedral ceilings with wood beams, hardwood floors, wet bar and a beautiful native stone wood burning fireplace in the spacious great room. This home is perfect for entertaining large groups. With five bedrooms and five baths it comfortably sleeps 14 with an additional sleeper sofa den with full bath. Custom and antique furnishings accent the mountain surroundings. Flat screen TV's in all rooms, gourmet kitchen with wormy chestnut walls, large open decks and a covered gazebo with fantastic views of Cashiers Valley. This is a true luxury mountain home professionally decorated with quality furnishings to provide all the comforts of home. Cashiers North Carolina is famously known as "The Heart of The Blue Ridge Mountains" and offers plenty of things to do for the entire family, including golf, tennis, fly-fishing, hiking, cycling and more. Stroll through the Village Green, a 12-acre park with outdoor sculpture by renowned artists, walking paths, boardwalks over wetlands and beautiful gardens. You’ll want to be sure to visit Whiteside Brewing Company with Bavarian-style beers with six year-round taps and a seventh rotating hearty ale. In addition to their craft beers, the menu includes great burgers and paninis with plenty of outdoor seating. In the mood for something a little more upscale? Check out the many fine dining restaurants including the award-winning Madison's Restaurant and Wolfgang’s Restaurant & Wine Bistro. nice place, we enjoyed it.